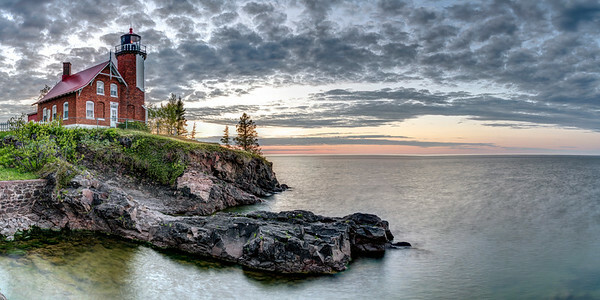 I drive through the Midwest with some regularity, and I've spent a fair bit of time (I could always use more) shooting on Michigan's spectacular Upper Peninsula. 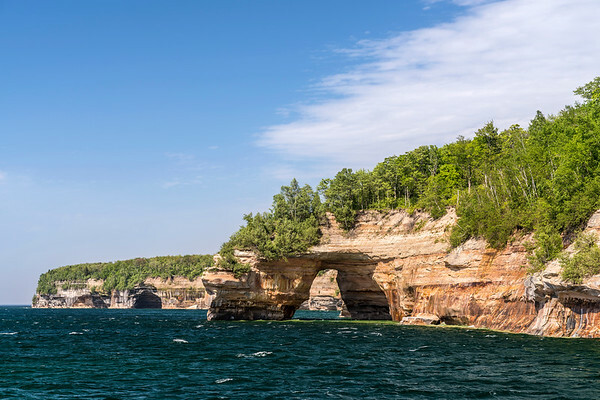 Blue waters, beautiful lighthouses, and Pictured Rocks National Lakeshore are but a few of this state's natural wonders. Michigan's Pictured Rocks National Lakeshore is famous, mostly, for the spectacular cliffs that plunge into Lake Superior's blue-green depths. But there's much more to the park, such as the many hiking trails that go through densely wooded areas like that shown here. Available in the following sizes: 12x8, 18x12, 24x16, 30x20, 36x24, 45x30, 60x40, 72x48. I think this photo, more than any other in my album, epitomizes what people envision when they think of visits to Pictured Rocks National Lakeshore, on the north shore of Michigan's spectacular Upper Peninsula. 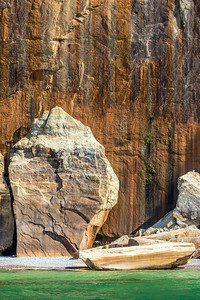 A warm day, complete with sun shining down on the dense forests growing above the orange cliffs that dive into Lake Superior's icy, blue waters. Available in the following sizes: 12x8, 18x12, 24x16, 30x20, 36x24, 45x30. 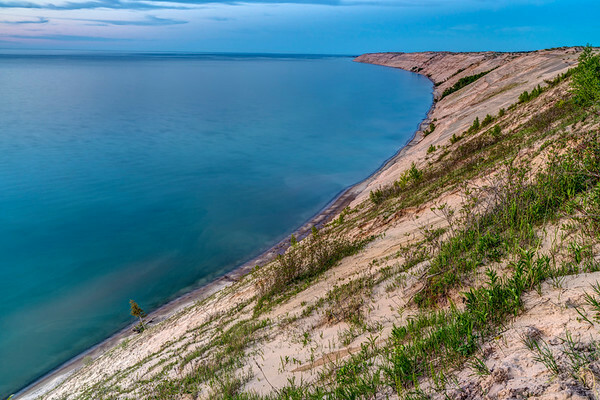 The cliffs that make up the namesake of Pictured Rocks National Lakeshore are, like all things in nature, in a constant state of flux. Thaws and freezes and natural erosion create an environment that is constantly changing, even if we find it hard to see on a human time scale. At some point in the not-too-distant past, the huge boulder shown in this photo was part of the cliffs above. Next year, or perhaps a thousand years from now, a view of this same spot may be conspicuously void of the rock that gives this photo some interest. Available in the following sizes: 8x12, 12x18, 16x24, 20x30, 24x36, 30x45. Sometimes an incredibly simple composition is the best way to go in a picture. 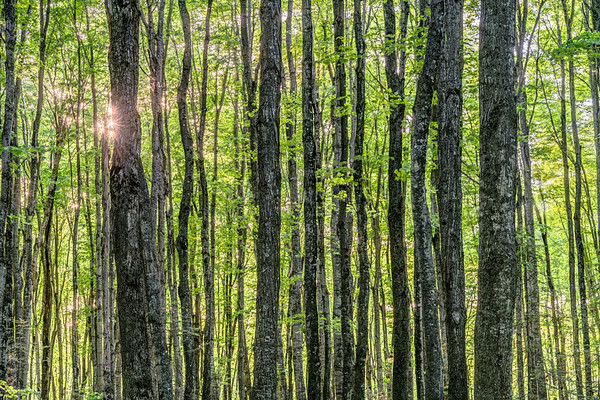 The three layers of this photo – sky, forest, and lake – divide the picture perfectly into three sections. 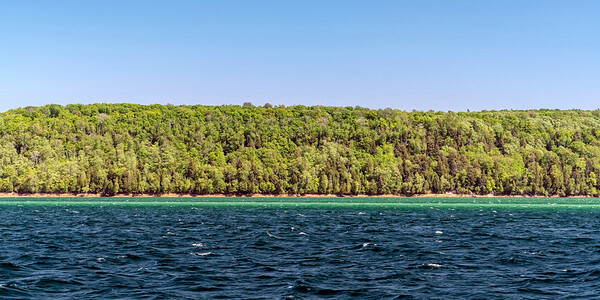 I took the photo while on a cruise through Pictured Rocks National Lakeshore, in the summer of 2017. Available in the following sizes: 20x10, 24x12, 32x16, 40x20, 48x24, 48x24 Triptych )3 x 16x24), 60x30, 60x30 Triptych (3 x 20x30). 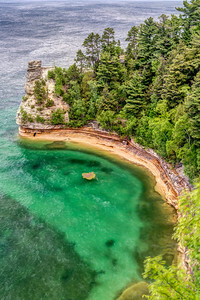 Miners Castle is the most famous formation of the Pictured Rocks, in part due to the fact that it is the only cliff area in the park accessible by car. As shown in this picture, there is one “turret” remaining of Miners Castle – a second turret collapsed into the depths below in 2006. Available in the following sizes: 8x12, 12x18, 16x24, 20x30, 24x36, 30x45, 40x60, 48x72. Michigan's Pictured Rocks National Lakeshore is famous, mostly, for the spectacular cliffs that plunge into Lake Superior's blue-green depths. But there's much more to the park, such as the many hiking trails that go through densely wooded areas that are seasonally filled with blooming flowers, like those here. Available in the following sizes: 30x12, 40x16, 50x20, 50x20 Triptych (3 x 17x20), 60x24, 60x24 Triptych (3 x 20x24), 75x30, 75x30 Triptych (3 x 25x30). Michigan's Pictured Rocks National Lakeshore is famous, mostly, for the spectacular cliffs that plunge into Lake Superior's blue-green depths. But there's much more to the park, such as the many hiking trails that go through densely wooded areas that are seasonally filled with blooming flowers, like those here. Available in the following sizes: 12x8, 18x12, 24x16, 30x20, 36x24, 45x30, 60x40, 72x48. Michigan's Pictured Rocks National Lakeshore is famous, mostly, for the spectacular cliffs that plunge into Lake Superior's blue-green depths. But there's much more to the park, such as this view, taken at dusk at “Log Slide Overlook.” Available in the following sizes: 12x8, 18x12, 24x16, 30x20, 36x24, 45x30, 60x40, 72x48. I spent roughly a week exploring Michigan's Upper Peninsula in the summer of 2017. I didn't have much in the way of concrete plans, or must-see sights, but when I stumbled upon Eagle Harbor Lighthouse one afternoon, I knew I'd need to stick around for at least one sunset, and one sunrise. This shot was taken just as the sun began to rise, the day's first light illuminating this historic lighthouse in a warm glow. Available in the following sizes: 30x12, 40x16, 50x20, 50x20 Triptych (3 x 17x20), 60x24, 60x24 Triptych (3 x 20x24), 75x30, 75x30 Triptych (3 x 25x30), 90x36, 90x36 Triptych (3 x 30x36), 105x42 Triptych (3 x 35x42), 120x48 Triptych (3 x 40x48). I spent roughly a week exploring Michigan's Upper Peninsula in the summer of 2017. I didn't have much in the way of concrete plans, or must-see sights, but when I stumbled upon Eagle Harbor Lighthouse one afternoon, I knew I'd need to stick around for at least one sunset, and one sunrise. This shot was taken shortly after sunset. Available in the following sizes: 20x10, 24x12, 32x16, 40x20, 48x24, 48x24 Triptych (3 x 16x24), 60x30, 60x30 Triptych (3 x 20x30), 72x36, 72x36 Triptych (3 x 24x36), 80x40, 80x40 Triptych (3 x 27x40), 96x48, 96x48 Triptych (3 x 32x48).